After Frontier screwed us over on the flight to Cancun, they offered a voucher that I could use within 90 days. It basically covered the cost to fly to Bismarck, North Dakota...and I needed to visit Theodore Roosevelt NP anyway, so this trip just kind of came together nicely. 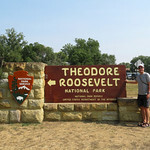 :) TRNP is basically some nice grasslands and badlands, paired with some great wildlife viewing opportunities. I visited both the north and south units, saw many bison, prairie dogs, and even a rattlesnake. Of the many little hikes I did, the most memorable was the Caprock Coulee trail in the north unit. Great views of the Little Missouri River!